I'm not sure if this is satirical or really drawing attention to some very odd real-world facts, or a mix of the two. Are these things all true? How do they actually work? To a certain extent in that the controls are plane-like, you do not have helicopter controls (no cyclic, etc. ), but you also do not have wing control surfaces, so in some respects like a plane, but not exactly. Big blade on top is not powered. True, the blades are unpowered; they rotate due to the wind. Some autogyros use power to rotate the blade to speed before take off, but the power is removed for flight. You can put it into a stall attitude, but it self-corrects; it is basically a rotating parachute.The fatal mistake that pilots made with early autogyros was that when they entered stall conditions they instinctively pushed forward on the stick which resulted in the 'fuselage' tipping forward and the blades chopping off the tail. There have been a few fatalities this way. Sort of like a powered parachute. Fairly good description. It is more like a powered paraglider than a helicopter or plane. Maybe this should be more common in Europe. They are still uncommon in Europe, but they are more common in Europe than the US. Wallis Autogyros used to make them in the UK in the 1960s. Check out the Bond film "You Only Live Twice" for one in action (ignore the missiles, etc. 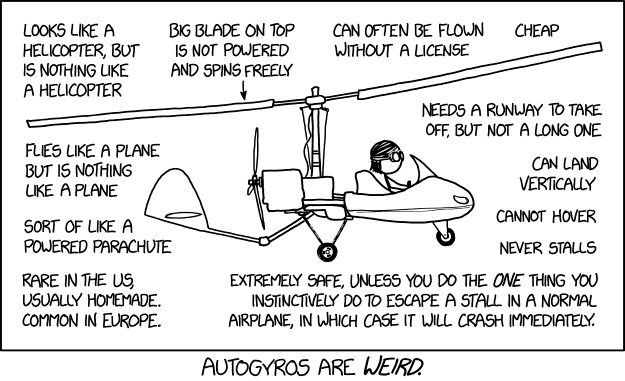 ; they are not standard fit on autogyros). Can often be flown without a licence. Not in anyplace I have flown in Europe. The US may be different. The "needs a runway to take off" statement is historically true of most autogyros, but many modern ones can take off vertically. It's called a "jump takeoff." It works by flattening the blade pitch so no lift is generated, coupling the engine to the rotor, and spinning the rotor up to a higher-than-normal RPM. Then the engine is decoupled, and at the same time the blades return to normal pitch. This uses the stored energy in the rapidly-spinning rotor to pull the autogyro upward. From there it transitions to forward flight before it has time to settle to the ground again. Not the answer you're looking for? Browse other questions tagged autogyro or ask your own question.